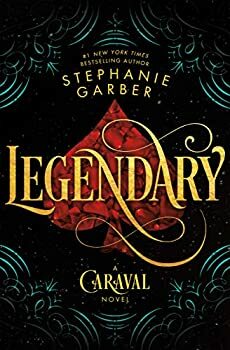 Legendary (2018) is the second novel in the CARAVAL trilogy. The third novel, Finale, is due out in May of 2019. I entered this series midstream, after sisters Donatella (Tella) and Scarlet have escaped their father’s controlling grip and freed themselves from the hold of their first Caraval competition. Now Tella is about to dive back into the stream for the sake of a debt she incurred in Caraval. This time she has to find the name and true identity of Legend, the grand master of the Caraval show. The only way she can do that is to enter and win. At the same time, she is trying to find clues to the whereabouts of her mother, who mysteriously disappeared when she was a young girl. As the narrative character and heroine, Tella is fatal, because I found she was little more than a prop in the opulent Caraval world. Outwardly beautiful, she’s inwardly deceptive, shrewd, and vain. She’ll make any bargain to get what she wants, not really caring about the consequences to others. In other words, Tella is supposed to have strong loyalties to both her sister and mother, but the focus details don’t really evoke anything authentic or even humane about her connections. In the end, I couldn’t invest in the heart of her story, not because I didn’t care, but because I couldn’t detect that Tella cared about anyone but herself. Nor could I see the beginning of a character growth arc. She’d been through one Caraval and all of its deceptions and illusions, and was just as ready to jump back into it. This may seem like a bit of a nitpick, but Stephanie Garber focused so much attention on the gorgeous things in the world, when the descriptions didn’t hold up, the whole façade fell away for me. My mother is a dress designer and she taught me to sew. Anyway, I know a thing or two about dress construction. Authors that use fashion in their novels should pay a little attention to those details. My point? Tella can’t have worn a backless dress with a “generous skirt.” There’d be nothing to sew all that skirt fabric to in the back. Skirt and top are not cut separately. Authors don’t have to be experts, but my goodness, do a little online research. I won’t be reading on in the CARAVAL series, but I think those who will love Legendary won’t be deterred by my criticism. Published in May 2018. The instant #1 New York Times bestseller! Stephanie Garber’s limitless imagination takes flight once more in the colorful, mesmerizing, and immersive sequel to the bestselling breakout debut Caraval. A heart to protect. A debt to repay. A game to win. After being swept up in the magical world of Caraval, Donatella Dragna has finally escaped her father and saved her sister Scarlett from a disastrous arranged marriage. The girls should be celebrating, but Tella isn’t yet free. She made a desperate bargain with a mysterious criminal, and what Tella owes him no one has ever been able to deliver: Caraval Master Legend’s true name. The only chance of uncovering Legend’s identity is to win Caraval, so Tella throws herself into the legendary competition once more—and into the path of the murderous heir to the throne, a doomed love story, and a web of secrets…including her sister’s. Caraval has always demanded bravery, cunning, and sacrifice. But now the game is asking for more. If Tella can’t fulfill her bargain and deliver Legend’s name, she’ll lose everything she cares about—maybe even her life. But if she wins, Legend and Caraval will be destroyed forever. Welcome, welcome to Caraval…the games have only just begun. TAYA OKERLUND's first career was in public service in the federal government. She previously lived in Japan and China and speaks both Mandarin Chinese and Japanese. More recently, she authored YA novel Hurricane Coltrane (WiDo, 2015) and currently reads and writes in spare moments between therapy runs and child rearing heroics.